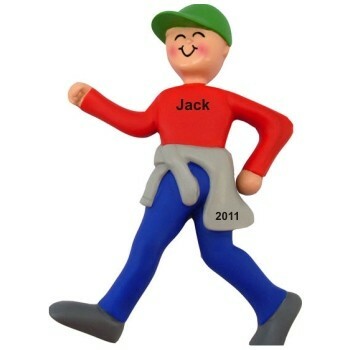 Tell him you're proud of his commitment to personal fitness with the walker/runner male personalized Christmas ornament in handsome style and colors. We hand letter his name and the year onto these sports ornaments personalized to be special keepsakes, and there's room on the back for an extra message from you. He'll be motivated to keep going strong when he receives the speed walking/runner male personalized Christmas ornament in our handsome velvet drawstring bag!